Citation Information: J Clin Invest. 2017;127(7):2647-2661. https://doi.org/10.1172/JCI91948. The progressive death of retinal ganglion cells and resulting visual deficits are hallmarks of glaucoma, but the underlying mechanisms remain unclear. In many neurodegenerative diseases, cell death induced by primary insult is followed by a wave of secondary loss. Gap junctions (GJs), intercellular channels composed of subunit connexins, can play a major role in secondary cell death by forming conduits through which toxic molecules from dying cells pass to and injure coupled neighbors. 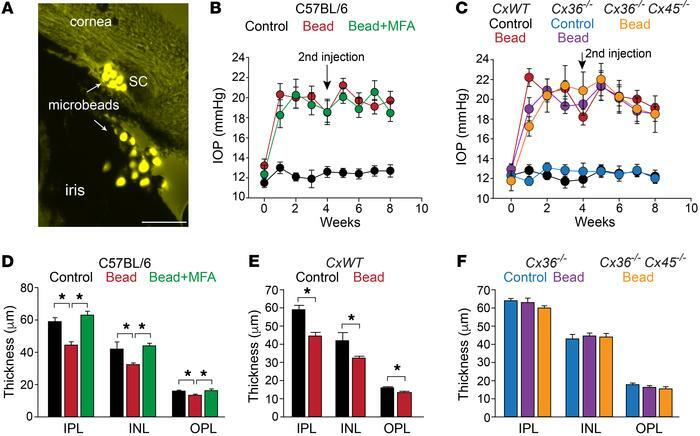 Here we have shown that pharmacological blockade of GJs or genetic ablation of connexin 36 (Cx36) subunits, which are highly expressed by retinal neurons, markedly reduced loss of neurons and optic nerve axons in a mouse model of glaucoma. Further, functional parameters that are negatively affected in glaucoma, including the electroretinogram, visual evoked potential, visual spatial acuity, and contrast sensitivity, were maintained at control levels when Cx36 was ablated. Neuronal GJs may thus represent potential therapeutic targets to prevent the progressive neurodegeneration and visual impairment associated with glaucoma. Blockade of GJs suppresses gross retinal injury in glaucomatous eyes. (A) Photomicrograph shows accumulation of microbeads in the iridocorneal angle and Schlemm’s canal (SC) 8 weeks after intracameral injection. Scale bar: 100 μm. (B) C57BL/6 mouse data showing sustained IOP elevation 8 weeks after initial microbead injection followed by a second injection at week 4 (arrow) in comparison with control eyes (sham injection of PBS). MFA application did not affect the elevated IOP observed in microbead-injected eyes (n = 10 eyes per group). (C) Elevation of IOP in different mouse strains following microbead injections (n = 10 eyes per group). Sham injections produced no elevation of IOP. (D) Thickness of individual retinal layers in glaucomatous retinas with or without MFA treatment (n = 6 retinas per group). MFA application prevents thinning of layers in glaucomatous eyes. (E) Thickness of retinal layers in CxWT mice with and without microbead injections (n = 6 retinas per group). (F) Preservation of retinal layer thickness in glaucomatous retinas of Cx36–/– or Cx36–/– Cx45–/– mice (n = 6 retinas per group). Data are presented as mean ± SEM. *P < 0.05, Student’s t test for B, C, and E and 1-way ANOVA followed by Tukey’s multiple comparisons test for D and F.